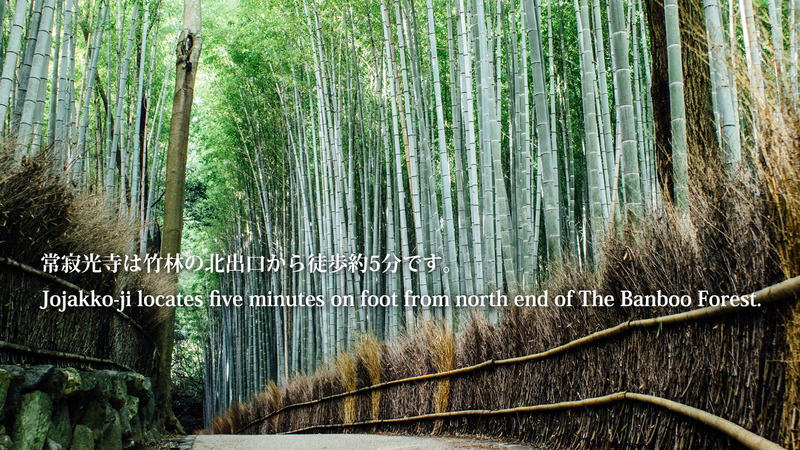 Jojakko-ji locates five minutes on foot from north end of The Banboo Forest. 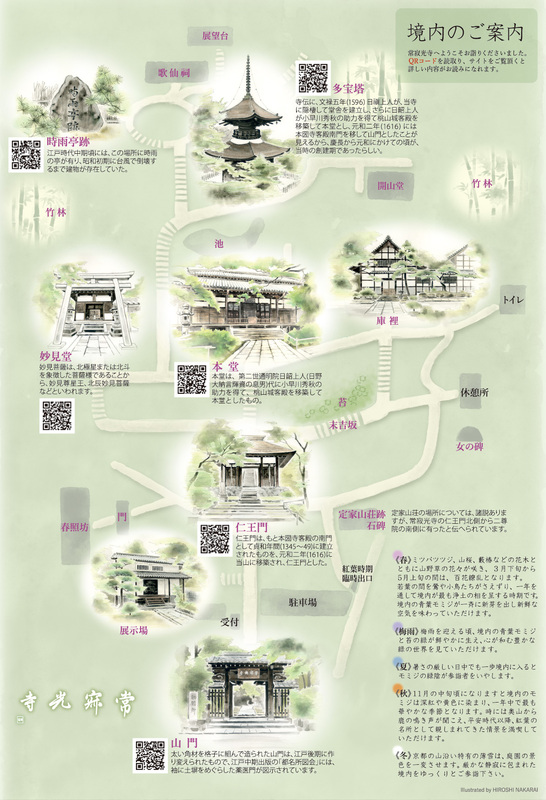 Since the Heian period (794-1192), the Sagano district has been famous as a scenic area where Imperial families and aristocrats erected detached palaces and mountain villas. 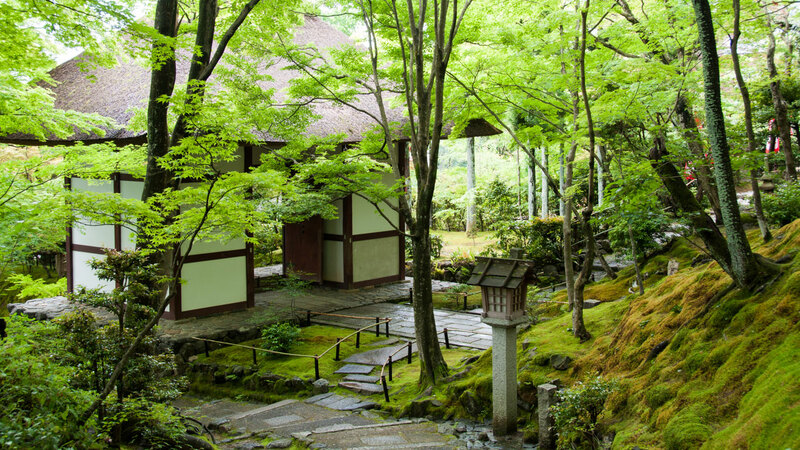 Especially in the areas around Mount Ogura, Kameyama and Arashiyama, there were countless villas and retreats of emperors, court nobles and poets. These included retired Emperor Saga’s Kameyama Palace, Prince Kaneakira’s Ogura-den Palace, and Fujiwara Teika’s mountain villa. 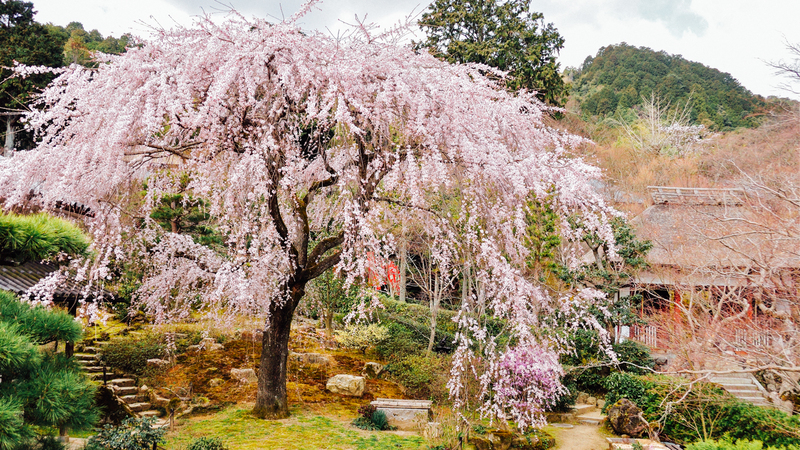 Since the retired Emperor Gosaga (1220-1272) transplanted cherry trees from Yoshino Mountain in Nara, Arashiyama has become famous for its cherry blossoms, along with Mount Ogura for autumn leaves and deer. On the grounds of Jojakko-ji, standing on the side of Mount Ogura, there is a site said to be the possible location of Fujiwara Teika’s villa, Shigure-tei. It was on the north side of Niomon gate. On its south-west corner are the remains of some building’s foundation stones. The villa had been reconstructed by subsequent generations over by Tahoto pagoda. 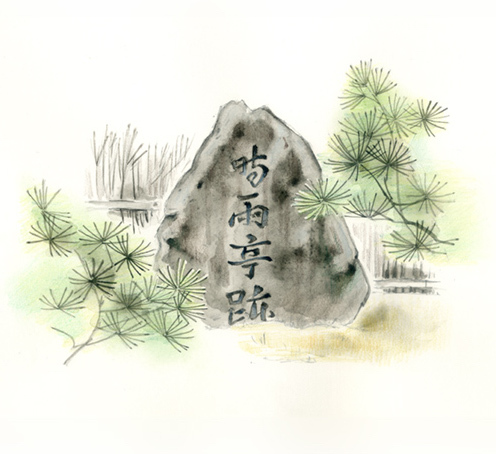 A stone monument for the Shigure-tei stands there today, next to the Immortal Poets’Shrine. Until the Meiji period, the tombstone of Prince Kaneakira was in the cemetery on the north side of the Tahoto pagoda. On the west side of Tahoto pagoda stands the stone monument to the poet Kinoshita Choshoshi (1569-1649), which indicates his close relationship with Priest Nisshin, who was also known for his poetry. 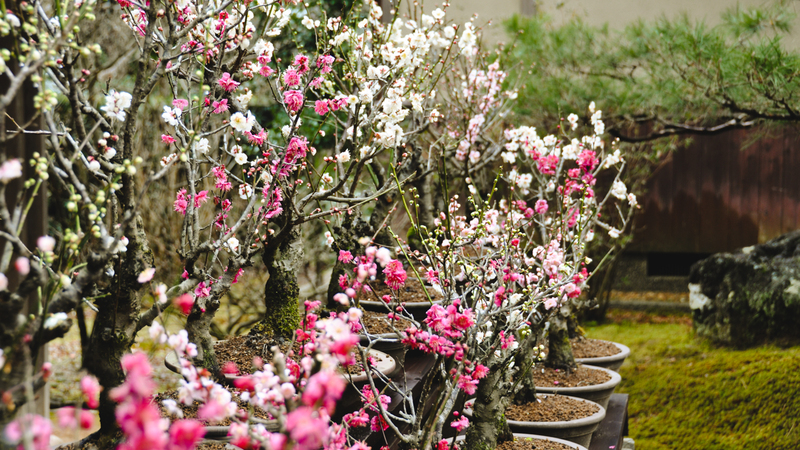 - In sevenfold and eightfold, yamabuki flowers are fully blossoming; what a pity, not even a single fruit is borne. - Hearing a stag calling, I look into my heart, living alone at the foot of Mt. Ogura. - Even living in a hermitage on Mt. Ogura, not a single day passes without my crying about this world along with the deer. - So desolate is this wintry mountain village, autumn remains only in the sound of a stag. - On Mt. Ogura, morning after morning a drizzling rain; yesterday maple leaves all around were tinged in faint colors. The main gate, built with rectangular timbers arranged in the lattice we see today, was renovated in the late Edo period (1603-1868). 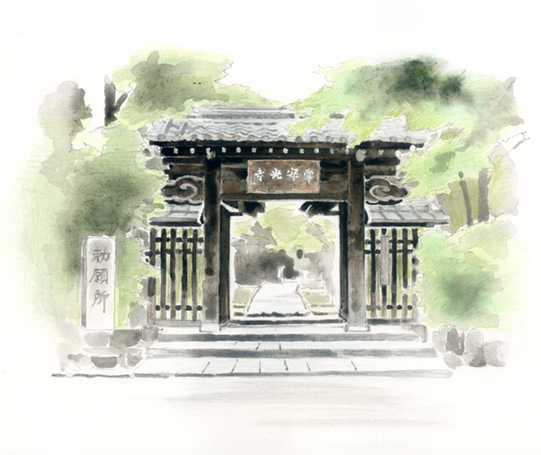 This Yakuimon-style gate was illustrated on the inner slip cover of the Miyako Meisho Zue (Guide to Famous Kyoto Sites) published in the mid-Edo period. At that time, there was a mud wall attached to the gate; after the renovation, it was removed. This gate has an open feeling to it. Even when the door is closed, one can see the approach through the widely spaced framework of the black-painted door lattice. Priest Nisshin was born in 1561 in Kyoto, the son of a high-ranking aristocrat, Hirohashi Kunimitsu. In his childhood, he studied under Priest Nissei, the 15th head priest of Honkoku-ji, the head temple of the Nichiren Buddhist sect in Kyoto, located in the Rokujo Horikawa area. Excelling in academic work, Nisshin took over as the 16th head priest of the temple when he was only 18 years old. From that time on, Priest Nisshin’s reputation stood high as an outstanding leader of the Nichiren sect. Both Kyoto townsfolk and distinguished samurai warlords such as Kato Kiyomasa, Miyoshi Yoshifusa and Koide Hidemasa became devout believers. 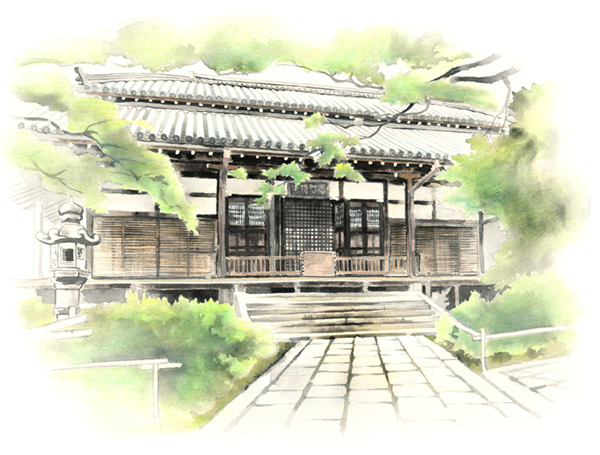 In 1595 when the Nichiren sect split into two groups over the issue of attending a Buddhist service held for the Big Buddha of Hoko-ji temple that Toyotomi Hideyoshi, the former Imperial Regent, had erected, Priest Nisshin strictly observed the teachings and regulations of the Nichiren sect, which did not accede to Hideyoshi’s enormous authority. He refused to attend the service at Hoko-ji, left Honkoku-ji and founded Jojakko-ji in 1596 here in Mt. Ogura on land donated by the head of the Suminokura family, who was a distinguished urban planner in those days. Nisshin was 36 at the time. Mt. Ogura had been a place famed for poetry from olden times, favored by such distinguished poets as Fujiwara Toshinari, Fujiwara Teika and Priest Saigyo. Because Priest Nisshin himself excelled in poetry, he chose Mt. Ogura for his retreat. In 1617, he came to the end of his life here at the age of 57. Priest Nippo (1659-1719) was a disciple of Priest Nichidatsu, who was the 31st head priest of Minobusan Kuon-ji (the head temple of the Nichiren Buddhist sect in Yamanashi Prefecture). 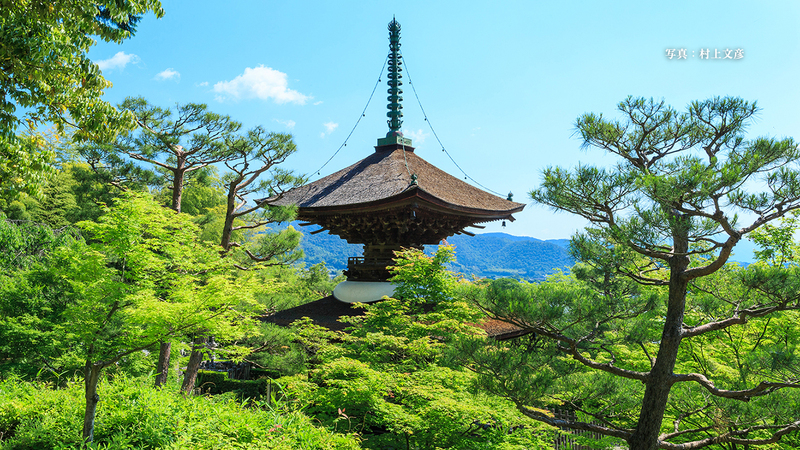 Nippo was the 22nd head priest of Ryuhon-ji temple in Kyoto, and was very well known for his mighty prayers and incantations. He practiced asceticism by sitting in the Kamo River for a thousand days. This act of faith attracted numerous devotees from inside and outside Kyoto, and there was always a constant flow of people to see him. Nippo performed faith healing to aid the recovery of the retired emperor Reigen from a severe illness. The ritual was conducted at Honzo-ji temple on Horikawa Street in 1712, and it miraculously worked. 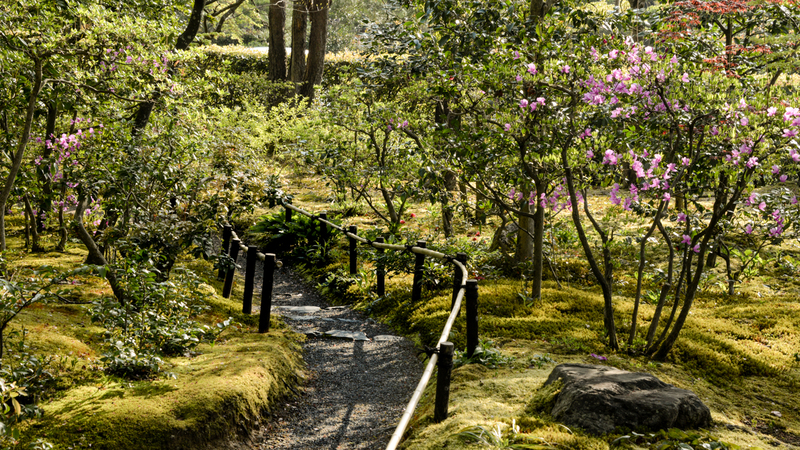 Nippo was thus given the honorary titles of Daikenjya (great spiritual practitioner) and Shonin (high-ranked priest). Honzo-ji temple was designated an Imperial Prayer Temple, Chokugansho, and came to be called Ichido-in. Nippo then became the 14th head priest of Jojakko-ji temple in 1715. 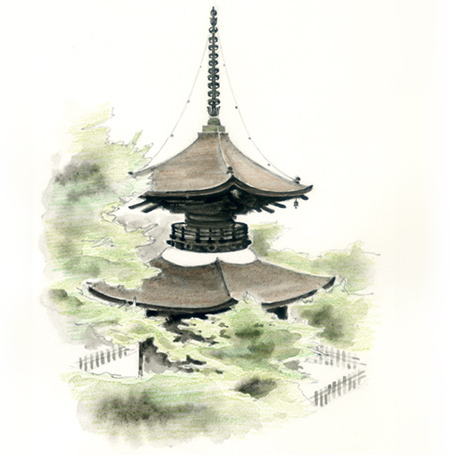 To commemorate this, the retired Emperor Reigen bestowed an imperial name plaque reading Heisonkaku (Pavilion of Two Respected Images) for the Tahoto pagoda. Also, a plaque reading Gokito-dokoro (Honorable Prayer Place), with calligraphy by Lady Joshoin of the princely Fushimi-no-miya family, was bestowed on the Main Hall. Priest Nippo is said to have passed away in 1719 at this temple, but no tomb has ever been found, either at Ichido-in or here at Jojakko-ji temple. 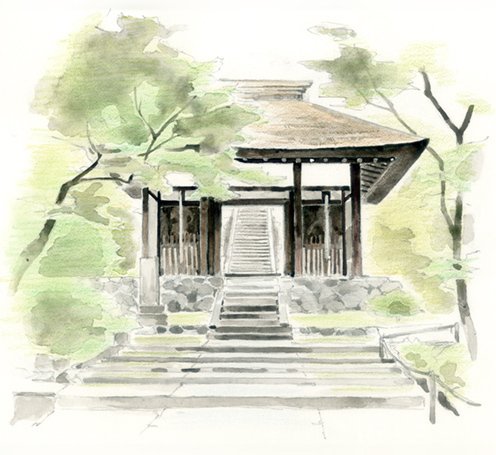 With a generous donation from the present chief priest of Honryu-ji temple, Noguchi Yasunobu, and his wife Masako, who were both deeply concerned about this lack, the Founder’s Hall and Priest Nippo’s tomb were erected in 2004. This gate served originally as the south entrance to the Guest Hall (Kyakuden) of Honkoku-ji temple, built during the Jowa era (1345-49). 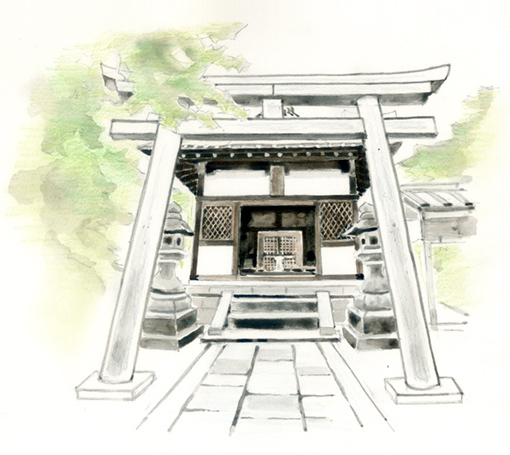 It was moved to Jojakko-ji in 1616 and made into the Niomon (a gate with Nio, two guardian gods). This is the oldest structure of all the buildings on the temple grounds. Its thatched roof is a rarity. The Nio statues are 210 cm tall, and are attributed to the renowned 13th-century Buddhist sculptor Unkei. Since Nio guardian gods are believed to have divine power to cure diseases of the eyes, lower back, and legs in particular, devotees in the neighboring towns come to offer a pair of straw sandals and pray for recovery from illness. The Myoken Bodhisattva is an incarnation of the Polestar or the Big Dipper; it is thus called Sacred Star King (Myoken Sonjo-o) or North-pole Myoken Bodhisattva (Hokushin Myoken Bosatsu). The “Dhāraṇī Jinju Sutra Preached by Seven Buddhas and Eight Bodhisattvas, Part 2” expounds that the Myoken Bodhisattva is the most eminent among all revered figures, and is thus regarded as a Sonjo, or sacred star, that protects the whole country. The sacred star is further said to vanquish death, enhance vital forces and increase one’s balance-sheet of happiness. Since the Heian period (794-1192), the Myoken Bodhisattva has been greatly respected as the chief of the stars, who presides over the fortune of all things in the universe. 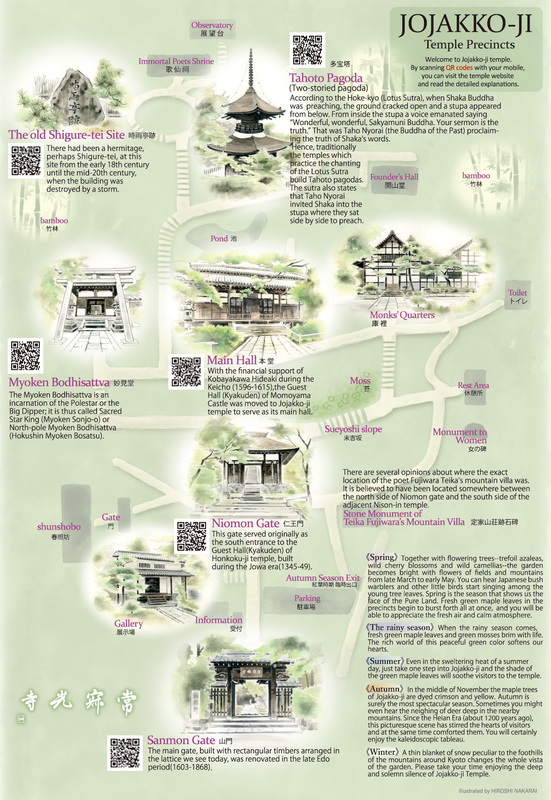 There are a number of temples which enshrine Myoken Bodhisattva in Kyoto and the nearby prefectures. In the Middle Ages, the Myoken Bodhisattva was embraced by powerful regional clans as their guardian deity. In early modern times, following the lead of several local lords who took refuge in Myoken Bodhisattva, many commoners also became believers. With the growth of the wealthy merchant class, the Myoken Bodhisattva turned into a god of commerce. It also came to attain widespread respect as a Bodhisattva who has beneficial power for easy births, prosperity and good marriages. Since the middle of the Edo period (1603-1868), the twelve temples which enshrine Myoken Bodhisattva, situated in the twelve directions from the Imperial Palace of Kyoto, have been designated as Rakuyo Junishi Myoken (Myoken of the Twelve Chinese Zodiac Temples in Kyoto) and considered to be especially powerful. Jojakko-ji temple is one of them, located in the direction of the Rooster (west). The Myoken Bodhisattva statue in this temple was found during the Keicho era (1596-1610) by a boatman living in Sumikura-cho, when the Hozu River flooded and the statue was mysteriously washed ashore. For years it was enshrined in the public assembly hall of Sumikura-cho district. It was transferred to this temple at the time of the 22nd priest (also named Nippo), at the beginning of the 19th century. Since then, it has been called “Tori-no-Myoken Bosatsu (the Myoken Bodhisattva in the direction of the Rooster).” Over the years from the end of the Edo period to the beginning of the Showa (1925-1987), the temple was bustling with worshippers, not only from Kyoto but also from the whole of Western Japan, who prayed for good luck and to ward off evil. In the time of the 26th chief priest, Nissen (?-1857), Myoken-do hall was constructed. During the time of the 28th priest, Nichigyo (?-1860), the torii gate in front of Myoken-do was donated by Hayata Sahichi, one of the followers, and four stone lanterns placed inside and outside the torii gate were donated in 1845 by the believers’ groups, Myoshinko and the Tenjinko. The names of individual and shop donors are engraved on the lanterns, including old establishments like Daikokuya, Matsuya, Ebisuya, Chojiya, Momenya and Owariya. As the name “Myoken” can also be interpreted to mean “beautiful features,” actors and actresses as well as women working in the entertainment quarters worship this deity. An exquisite table, placed before the altar in the hall, was donated by kabuki actors. The popularity of Tori-no-Myoken soared during the Bunsei, Tenpo and Koka eras (1818-1846) and greatly contributed to the protection of Jojakko-ji temple. In the time of the 42th priest, Nikken (1878 -1942), the Myoshin-kai group and a women’s association were formed by the followers and local merchant families. The Myoken-do Worship Hall was added in 1928 and the fence around it was donated in 1933 by believers. In the time of the 44th priest, Nitto, in 1974, the main hall and the Myoken-do Worship Hall were entirely refurbished with donations from devotees and supporters as well as income from the admission fee. In 2006 their roof tiles were renewed and the lattice-ceilings were restored. In this way Myoken-do hall has been maintained and refined along with the history of Jojakko-ji temple. When you come to the temple, you really must visit Myoken-do. With the financial support of Kobayakawa Hideaki during the Keicho era (1596-1615), the Guest Hall (Kyakuden) of Momoyama Castle was moved to Jojakko-ji temple to serve as its main hall. This was the time of the 2nd priest, Nisho. According to illustrations found in literature and other material from the Edo period, the Main Hall had a two-layered hon-gawara-style roofing (the style using round and flat titles overlapping alternately). When major repairs to the Main Hall took place in 1932, it was converted to the present hira-gawara-style roofing (the style using flat tiles only). The belfry was constructed by the 4th chief priest, Nissen, in 1642. The original temple bell was appropriated during World War II to make use of its metal. The present bell was cast in 1973 under the design and supervision of Dr. Aoki Ichiro. It has the classic style of acoustics called ojikicho. Every day, the bell is struck at noon and at 5 pm. According to the Hoke-kyo (Lotus Sutra), when Shaka Buddha was preaching, the ground cracked open and a stupa appeared from below. From inside the stupa a voice emanated saying “Wonderful, wonderful, Sakyamuni Buddha. Your sermon is the truth.” That was Taho Nyorai (the Buddha of the Past) proclaiming the truth of Shaka's words. Hence, traditionally the temples which practice the chanting of the Lotus Sutra build Tahoto pagodas. The sutra also states that Taho Nyorai invited Shaka into the stupa where they sat side by side to preach. There are several opinions about where the exact location of Shigure-tei, the poet Fujiwara Teika’s (1162-1241) mountain villa, used to be. It is believed to have been located somewhere between the north side of Niomon gate and the south side of the adjacent Nison-in temple. In this same area there originally used to be a small shrine built some time during the Muromachi period (1392-1573), dedicated to Teika with his statue inside. Later, when Jojakko-ji temple was erected in 1596, the monks’ living quarters turned out to be located higher than this august shrine, so it was moved to the present site, higher on the hillside. At first, it was a miniature shrine, but was rebuilt in its present size in 1908. It has been called the Immortal Poets’ Shrine (Kasenshi) since then. The name plaque was written by the well-known ink painter Tomioka Tessai (1837-1924). There also used to be a hermitage on one of the possible old Shigure-tei sites, immediate south of the Immortal Poets’ Shrine. It was destroyed by a typhoon in the early 20th century and has not been rebuilt. 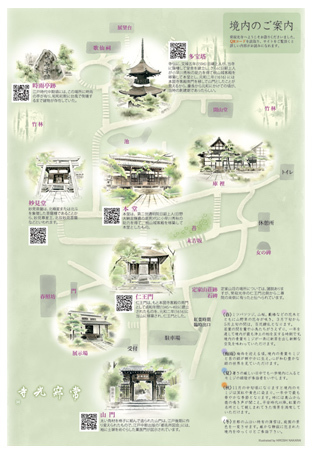 The construction date of this hermitage is unknown, but a map of the temple grounds included in an old document housed in this temple, Story of Sojuin Priest Nissho (1728), has an illustration of a hut in this location. 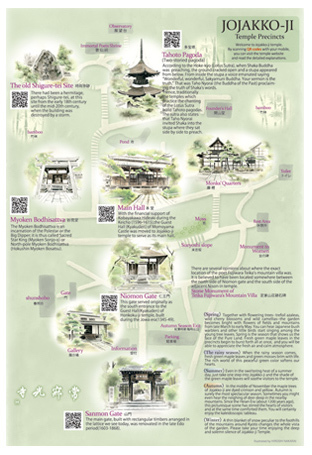 The same building is also shown in Guide to Famous Kyoto Sites (1780). This proves that it was here as early as the mid-18th century.